Save Big on A Royal Caribbean Cruise! If you ever wanted to check out Royal Caribbean’s Quantum Class ships now is the time to make your move and explore the Anthem of the Seas®. Feel the rush skydiving right on the deck of the ship with the RipCord by iFLY® skydiving simulator. Or play at the SeaPlex, an activities space that’s a real game changer, offering bumper cars, a roller rink, circus school and more. If leisurely pursuits are more your speed, enjoy breathtaking island sights from the best seat in any house, the North Star. Or grab a drink at Bionic Bar, where mixology meets technology. Buy One, Get Second Guest 60% off + 30% savings for 3rd/4th guests on all sailings departing on or after March 2, 2017 (Excluding China departures). 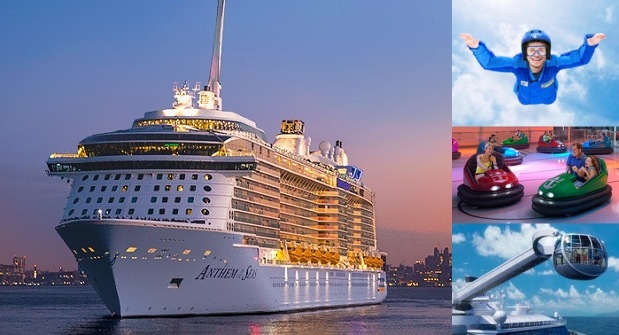 Bookings made Feb. 1-13, 2017 on Anthem of the Seas sailings departing on or after April 2, 2017 are eligible for free upgrade from Ocean View to Balcony. This offer expires February 28, 2017. Call Susan in our Leisure Department at (678) 420-2510, Toll-Free: (800) 950-2950 or send her an email at vacations@teplis.com to plan your RCCL adventure today!